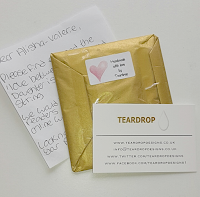 If you follow me on some of my other social media accounts, you will have seen that I received a beautiful little gift from a company called Tear Drop Designs. If you didn't see it then don't worry because this blog post is going to be a review of what I received.. Tear Drop Designs is a beautiful up and coming jewellery brand that sells a range of handmade wish string bracelets and necklaces with so many meaningful messages about them for such low prices, which are all to bring you some luck for all of those Dreamers, Believers and Achievers out there with each piece being made with love and care. 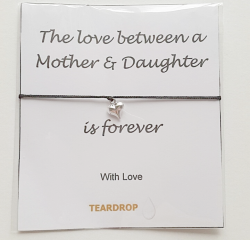 Tear Drop Designs got in touch with me and asked me to choose one of their bracelets from their website, I picked "The love between a Mother & Daughter is forever" wish string which has a 1mm black nylon thread and a tiny silver plated small puff heart charm. I chose this bracelet because I liked the meaning behind it, a few of you knew Phil and me lost our daughter at 17 weeks pregnant on Christmas Day a few years back so this bracelet and meaning really stud out to me. I want to mention first how quickly it came after my order went through with them, it arrived the very next day! It came in a small white jiffy bag with bubble wrap on the inside to avoid any damage whilst being in the mail. Inside was a small package wrapped beautifully in gold tissue paper with a small "Tear Drop Designs - Make With Love" sticker on it. Firstly, the fact that someone has wrapped up my little parcel and took time out of their busy lives to do so means a lot. It really does put event more of a special handmade touch on things. I opened mine very carefully and inside it had my beautiful bracelet with an elicate black string. Since I have tiny tiny wrists I always find it hand it find the right type of bracelets for me but the fact that it's adjustable by pulling on the ties at the back of the bracelet is awesome! I've worn the bracelet a couple of times now and was honestly worried that it would snap or get broken easily as it's so small and delicate but it's as strong as ever and I'm so happy about it! Not only do they have a huge collection to chose from on their website but they also have a gorgeous "Butterfly String" bracelet were £2 from each order is donated to Claire House Children's Hospice. If you have never heard of Claire House Children's Hospice, it's a wonderful place which offers care, support and choice to families whose children won’t live to be adults. Whilst the hospice building is located on the Wirral, Claire House aims to offer the very best care wherever and whenever a child and family needs it, whether they choose to come to the hospice or are looked after at home with their Hospice to Home Team. 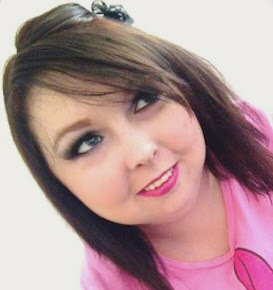 At Claire House, they focus on not what they do, but why they do it. Their nurses take over for a couple of days so mum and dad can be parents, as opposed to carers 24/7. Their physiotherapists help children who are confined to a wheelchair most of their day, feel the freedom and movement of water in our specially adapted hydrotherapy pool. The play therapists do so much more than just playtime; they help their families create memories that will last a life time. And their Family Support Team are on hand to offer emotional support to families when the very worst happens, for as long as they need it. As you can tell they are a wonderful amazing charity and I love the fact that an upcoming business is supporting it! Discount Code: This brand is amazing and I know I'll be ordering more from them soon, they are the perfect little meaningful gift to give family and friends. 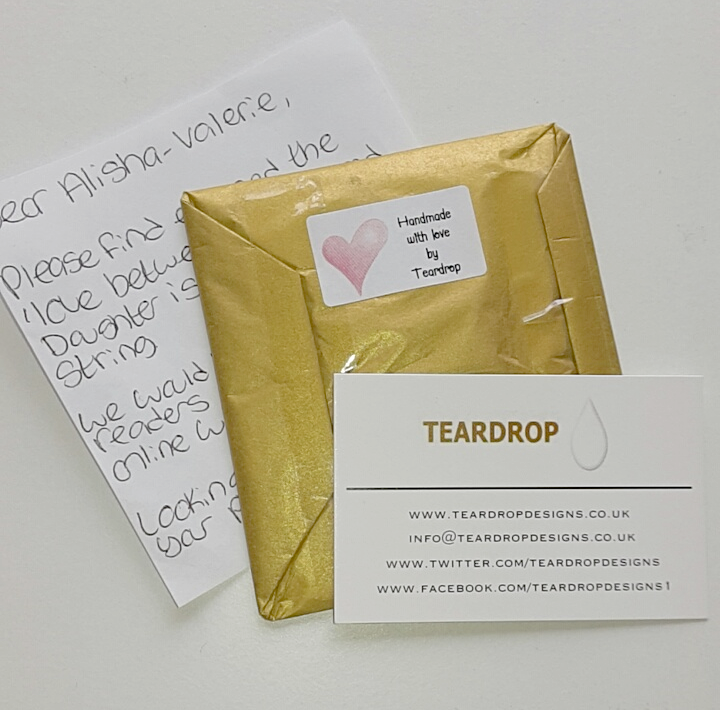 Tear Drop Designs have kindly given all of you amazing people out there a discount code for their website which is "TearDrop16" where you can order whatever you like and receive 20% off your orders! Thank you so much for Tear Drop Designs for this beautiful bracelet I love it! I can't wait to see all of your orders soon and pictures soon. Hope you all have a wonderful day.